One of history's most powerful storms has devastated the central Philippines, priming it for a public-health crisis. For many survivors, awaiting aid, the scene is perilous. Typhoon Haiyan tore across the central Philippine islands on Friday, in what The New York Times described as "play[ing] a deadly form of hopscotch." That metaphor might feel oddly lighthearted given that the governor of the Tacloban estimates 10,000 deaths in his city alone. "We had a meeting last night with the governor and the other officials," Elmer Soria, a police chief superintendent, told Reuters. "The governor said, based on their estimate, 10,000 died. The devastation is so big." Local and international aid is mobilizing quickly, but the situation for many survivors is being described as perilous. Support and rescue are difficult not only because of lack of access to the areas hardest hit, but also because of mob rule. Philippine Red Cross chairman Richard Gordon described "mobsters" attacking trucks attempting to deliver food and tents on Tanauan bridge in Leyte. President Benigno Aquino III is dispatching soldiers and armored vehicles to stop looting and contain violence. 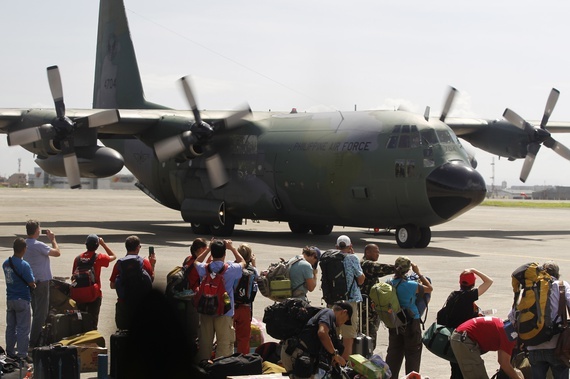 U.S. defense secretary Chuck Hagel has deployed ships and aircraft to deliver emergency supplies and help with search-and-rescue efforts, and the U.S. Embassy in Manila has immediately mobilized $100,000 for health and sanitation efforts. The scale of destruction is massive, likened by the head of the United Nations disaster assessment team Sebastian Rhodes Stampa to the 2004 Indian Ocean tsunami. Expect images and quantification to put it into perspective over the coming days. Winds reached 195 miles per hour and storm surges were 13 feet in places on Friday. The National Disaster and Risk Reduction Management Council has put the as-yet verifiable death toll at 151. The Philippine government gave an early count of 229 but said it expects that number to increase significantly. Gordon estimated that there are thousands of bodies. Counting them is difficult because they are widely dispersed and inaccessible. Photos taken from the International Space Station help illustrate the magnitude of the weather pattern. The storm has now moved to Vietnam, where it made landfall early Monday morning (local time). Almost a million people in the northeastern part of the country were evacuated in anticipation.